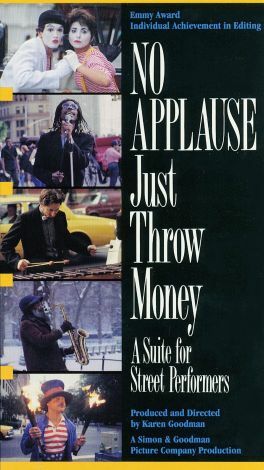 The long tradition of street performing is charmingly portrayed in Karen Goodman's documentary. On any given day in New York City, dancers, singers, magicians, and mimes transform sidewalks into stages. No Applause, Just Throw Money spotlights over 100 street performers around New York as they attempt -- even for just a moment -- to make the city stop and watch their show. Famous musicians from Irving Berlin to Jackson Browne have been street performers at one time, and the artists featured in this film are no different in that they are trying to create while making a living by passing the hat. No Applause, Just Throw Money is a vibrant portrait of an exciting theatrical tradition.